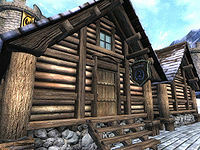 Nord Winds is a clothing, weaponry and armor store located in Bruma. It is found on the second level of houses in the city; above the Fighters Guild Hall and next to Novaroma. The proprietor, Olfand, has 1000 gold and a Mercantile skill of 60. He also offers repair services as well as basic Light Armor training. When bartering, he will buy your weapons and armor, as well as miscellaneous items while only selling the last two. His wares include the unique cuirass Dondoran's Juggernaut which fortifies your Strength and Endurance while draining your Speed and Athletics. His wife Skjorta is a Clothier with the same gold and Mercantile skill level as her husband, who buys and sells any type of clothing. She should have been able to sell the unique Councilor's Hood, but she doesn't due to a bug. The main trading room is on the ground floor and consists of three counters with a large selection of clothes, armor and miscellaneous items on display. In a corner is also a small forge with an anvil, bellows and a furnace. Both Olfand and Skjorta live downstairs, as is usual with Bruma houses and stores. Their private quarters consist of an antechamber used for storage and another room, locked, used both as a dining room and bedroom. This page was last modified on 7 June 2013, at 02:04.